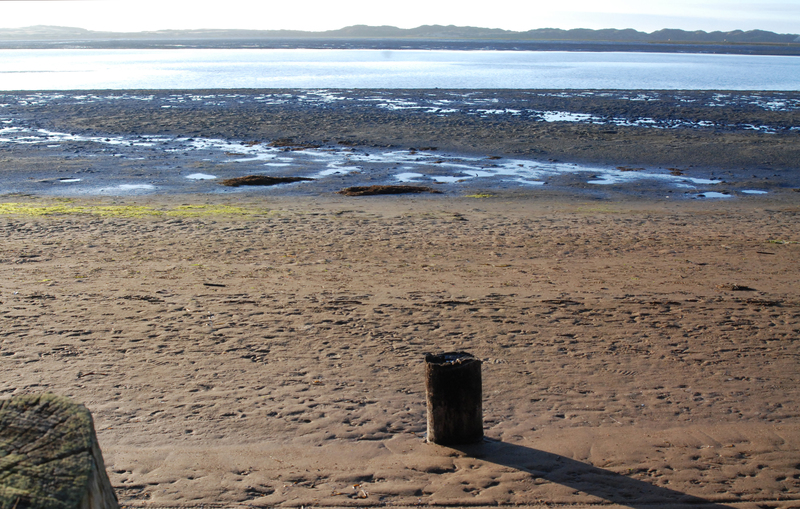 Mudflats can look barren, though they’re anything but. They are composed of fine sediment that settles out of the water, building up over many years. Mudflats often form along the edges of estuaries, like Morro Bay, that are protected by a sandspit. The slow moving, shallow waters near the shore allow organic material to linger as it breaks down, making mudflats especially nutrient rich. This allows these flat expanses to host a lot of life. Mud flats at Windy Cove during a very low tide. Another interesting feature of mudflats is that they are sometimes submerged and sometimes exposed, all depending on the tides. The animals that live there must be specially adapted to deal with these drastic changes in their habitat. The same spot at Windy Cove during a very high tide. They must also be able to avoid predators. 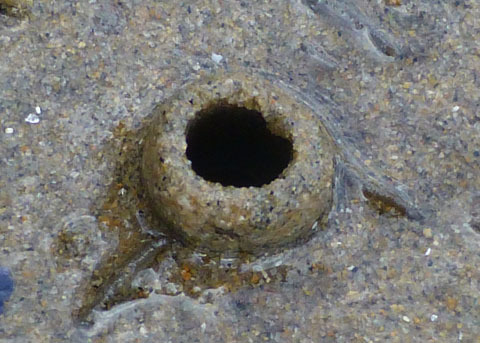 Many mudflat dwellers do this by burrowing beneath the surface. 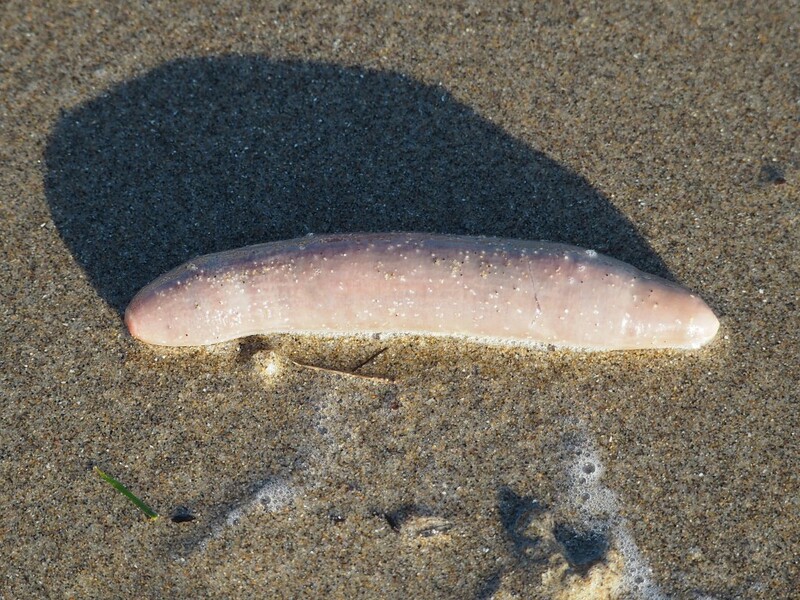 The fat innkeeper worm (Urechis caupo) is one of them. Fat innkeeper worm. Photograph by J. Maughn, via Flickr. These worms are between six and nine inches long, and they make a unique burrow that is shaped like the letter U. If you are looking down on this burrow from the top, you might see what looks like a tiny volcano made out of mud. That is the end of the burrow through which the worm captures its food. Fat innkeeper worm burrow. Photograph copyright Dr. Peter J. Bryant. If you could see beneath the mud, you could watch the innkeeper worm spin a mucus net across this side of the burrow, and then move back down into the bottom of the U. It keeps a hold of the mucus net, and then pumps water through the tunnel, which causes edible material to enter the mucus net. When it is full, the innkeeper worm ejects any large material and then swallows the net and its spoils whole. The discarded food materials don’t go to waste. They feed a variety of other animals that make their home in the innkeeper worm’s burrow. (Thus, the worm’s unusual name.) The innkeeper worm’s tenants, so to speak, can include pea crabs and scale worms—which may stay awhile, and arrow gobies—which pop in and out. While they benefit from the innkeeper worm’s room and board, they don’t positively or negatively affect the innkeeper worm itself. This is called a commensal relationship. Having a lot of friends and a deep burrow can’t keep the innkeeper worm entirely safe. 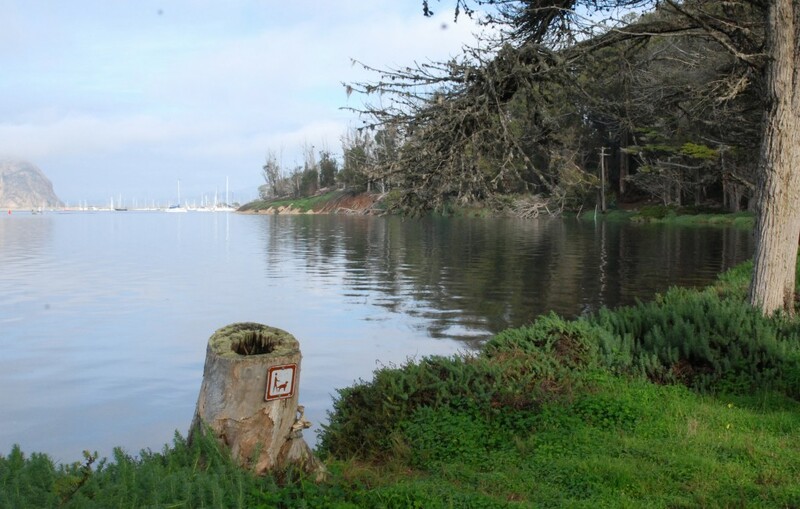 They are prey for leopard sharks, bat rays, and otters—all residents of Morro Bay. 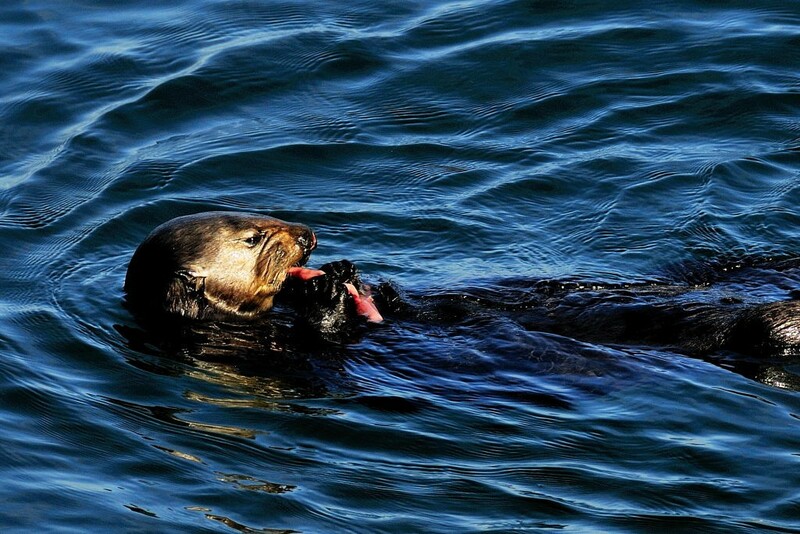 Sea otter munchking on a fat innkeeper worm. Photograph by Jason Bechtel, via Flickr. If you or your kids want to learn more about fat innkeeper worms and their commensal companions, check out local author Evelyn Dabritz’s storybook How the Innkeeper Worm Got a Full House.